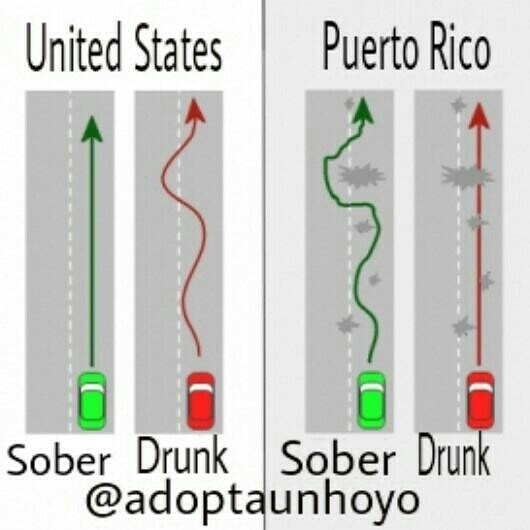 Almost every blog I’ve read about Puerto Rico has a post about driving here. I won’t say it’s the worst place to drive in the world, I know lots of other places are quite chaotic, but I will say during the first few weeks here (and still a little now) I experienced a lot of white knuckles. I don’t post this as a rant, as it's not really a complaint, more of just an observation about the way it is. My perception of driving here could be biased due to the fact that I drove very little over the last few years, but I don’t think I’m the only transplant here that finds the driving situation a bit more colorful than in the states. While I haven’t seen any major accidents since we’ve been here, there are definitely a lot of cars with dents and different color panels, as well as cars missing or dragging large sections. I think there is a sort of semi-controlled chaos going on in the driving scene and you have to learn to read other drivers very quickly in order to not be merged into or slam into the back of a truck with no brake lights. The roads and signs in Puerto Rico follow the same standards as the mainland U.S. The only main difference being the miles/kilometers mash up - gas is sold in liters, distances are marked in kilometers, but speed limits are posted in miles per hour. We have all the same standard road types: highways or toll roads and the same traffic laws, but (in my opinion) the main difference lies in enforcement and maintenance. The toll roads are pretty well maintained, I presume, by the tolls paid to them, and are very useful for getting around the island if you have the toll pass (rental cars come with them). They aren’t intended as a quick alternative to short distance commutes as you can go 15km without seeing an exit. If you’re just trying to get to the other side of town or a few cities over even, you’ll have to stick to the old hwy/road system which is where the real adventure happens. As I mentioned above, cars come in all conditions here, and I've noticed quite a number that don't have functional lights, especially brake lights. In the states, its an automatic ticket if a cop sees you without brake lights, here it’s not as heavily enforced from what I can see. This can lead to some hair-raising moments, especially when the traffic suddenly slows because everyone is swerving around a pothole up ahead. Keeping an extra amount of cushion between me and the other cars is something I try to practice but its not easy, gaps in traffic allow for cars to cut in, traffic weaving is a common way for people to get from point a to point b faster apparently. Lane changes are often unannounced as blinkers aren't commonly used or when they are it’s not a signal for “hey, would you allow me space to come into your lane” it’s a signal for “I’m in the process of moving into your lane so you’ll need to make room for me either way." You start to get a sense for when the car next to you wants to come into your lane or is about to cut you off regardless of their blinker situation. There are even a number of cars that drive with their hazard lights on for not so apparent reasons. I've learned very quickly that traffic patterns can vary from light to light and that any lane can be a turning lane, even shoulder lanes work too. At the end of our main road there are three lanes at the light. The far left is clearly a left turn lane as there is a shoulder that divides it from the other two lanes. We've learned that if we want to go straight to get to the gas station across the road, we need to be in the far right lane in order to go straight. Mind you there are no signs indicating which lanes should turn or go straight, its a just a common understanding on how the traffic has evolved to flow. One might get the sense that it’s the wild west out here, but there are plenty of police out on the roadways, and they definitely pull people over, but there are only so many cops and seriously a LOT of drivers here. A note for future tourists, most emergency vehicles drive around with their lights flashing all the time, it’s not until their siren goes off that you’re being pulled over or need to get out of their way. I’m not sure what the reasoning behind this is (there is debate around it) but either way it makes sure their presence is known. There are plenty of safe, drivers, here but enough aggressive drivers that it can make for an eye opening experience. There are some pretty interesting driving tactics used to get where you need to go. You start to realize its totally acceptable to reverse your car down a street because you missed a turn, or to see a car cutting across the entire highway from the left lane because they almost passed their exit. Who knows, maybe it makes everyone else more vigilent drivers when you realize the variety of scenarios that could happen while you're driving. Driving here can be scary, but as long as you are constantly paying attention to what’s happening around you you’ll be fine and you’ll probably see some pretty interesting sights in the process. 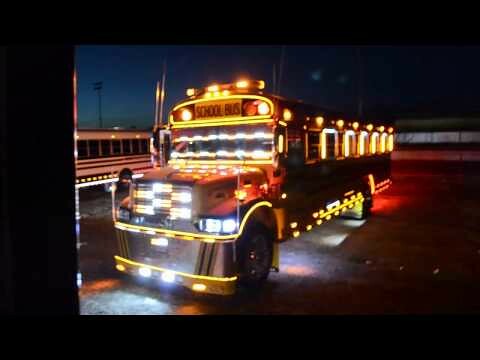 My favorite scene on the road are the school buses decked out in flashing party-bus style lights, because during the day they serve as school buses and at night they serve as party-buses. Driving here isn’t necessarily bad or good, its just Puerto Rican, and it wouldn’t be Puerto Rico without a little party and adventure on the way to school.